The SeaWing is a single boat mid-point mounting carrier that provides quick set-up for large beam kayaks while providing more rooftop space than any other traditional bottom down system. Includes the Stinger Load Assist Module and Bow and Stern tie Downs. 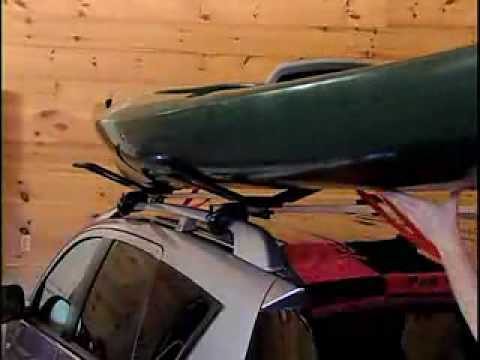 This rack makes loading my 117 lb kayak a one man job, without it there is no way I could Load my kayak without damaging my suv. My kayak is 36 inches wide and tests partially on the stinger when tied down. The straps that come with the seawing are not long enough to use. All in all its a very good mount, especially if you Load your kayak by yourself. Makes loading a kayak by yourself so much easier. The bolts it came with were too long and were hitting the roof of my Tahoe, but I went to a hardware store and got some 3/16" x 2" bolts and it works fine. My kayak is 75 lbs i am 65 and have a bad back. i am able to load and unload without help. That is a big deal for me. Product is excellent. Worked great for transporting our Wilderness Systems Pamlico 160T using the factory roof racks on our Toyata Rav4. Out of the water the 160T is a beast of a boat at 16' long and weighing approximately 90# fully outfitted with seats and rudder. Getting it on the roof of even a moderately high SUV like the Rav4 normally takes the efforts of two strong men and a boy, but Malone's innovative "Stinger Load Module" made loading the kayak much less difficult. The wing shaped bunkers and provided straps and bow & stern ropes held of the carrier held our "cruiser" snugly in place on our three hour road trip to a mountain lake. Sure you can buy less expensive racks but you will not get the quality and convenience that you get with the Malone SeaWing Carrier Combo. If like us you are hauling a plastic Queen Mary you will be glad you spent the extra dough. Very pleased with this carrier. I is very well built, easy to install (though instructions did not explain some of the parts supplied; however, email to Malone verified what I thought: extra bolts are for different height carrier bars and washers are used with bolts/wingnuts). Load module allows one- person loading of kayak. Very good product. Lets you load a kayak by yourself from the back of your car. I have used it twice now and and had no problems other than the following. Replace the rubber tape on the V-slide at the back with Teflon pieces with the edges rounded or champfert. I had some sand on the bottom of the kayak and the tape came off. This product works exactly as advertised. I was concerned regarding loading my 60lb+ kayak on my own on top of my SUV - using the Seawing with Stinger it's pretty uneventful...after some practice. The only issue I have is that the carrier wings bend under the weight of the kayak, especially on a bumpy road. The Malone Seawing Kayak carrier with Stinger load assist is a remarkable product. It's simple to install and the perfect setup for loading a kayak on the roof of your car, solo. I have much more costly Thule carriers that hold the kayak on its side, but getting the boat up there alone is hard work. The Malone rig makes loading effortless for one. It has performed flawlessly. It's tough, well-made, and can stand up to frequent use. I plan to get another for a second boat. Unlike other saddles, this rack attaches at the center point, creating enough space for two'even on 48-inch crossbars. Great product! Good, tough and innovative product from Malone thanks to which I can finally load my 14foot/23kg kayak onto the car rack on my own. Very much up to expections, thanks also to ACK excellent service, expecially for shipping out to Europe! The product is good but it does NOT extend back far enough to be real useful on my 2009 Honda Fit Sport. The stinger part is not long enough to land on the deflector on the Fit Sport so the kayak sits on that instead. This kind of defeats the purpose of having it protect my car. Mounted on a Malone base on top of a 2009 Toyota Highlander. Allowed me to carry 2 Hobie Revos flat, which makes them very easy to load. No stability issues at 70-80 MPH, 1500 miles. The Stinger is a great innovation. When I am getting ready to load my kayak people always come up to guve me a hand...so I show them how easy it is to load by myself and they are always impressed. A 70 lb. kayak onto the roof of my Tahoe by myself...very easy. This is the BEST product for loading a kayak on your roof rack! I'm 5'4", not in particularly great shape, and I can load my 16', 80 lb kayak by myself! The stinger attachment makes all the difference! Gr.eat product and value. I need to bring ny kayak to ACK for servicing. I talked to Zac about three-oclock on a Friday afternoon. He gave me some good ideas and I ordered the Stinger Seawing SS. The delivery was made the next day on Saturday morning before I could wake up good and get a cup of coffee. This unit was very easy to install in just a few minutes and that takes into account that I am a senior citizen who is mechanically challenged by any anything more than a screwdriver. The trip to Austin was made easily with a very secure kayak on top of my SUV. I highly recommend this product. Great price, communication, and fast shipping from ACK. The SeaWing/Stinger combo is much easier to load and unload than the previous "J" style carriers we had on our Jeep Liberty. The lower profile, both loaded and unloaded, allows us to drive in and out of our garage making it much more convenient. Very secure going down the road too. Sound and well-engineered piece of kit. It was easy to assemble and install. Works just like it says. I use it for a 14 ft boat and find it perfect for my Toyota Highlander. My only quibble is that it didn't fit my factory roof bars (wide aero) and I had to buy a new set of square cross bars. Q: Will this work with the emotion Guster 10 volcano? A: Yes, this should work with the Guster! Q: I'm intrested in this product for my 2017 Toyta Rav 4 hybrid. I'm looking to get a Hobey outback which weighs approximately 82 pounds on when this work for that vehicle and kayak.? A: Hey there, thanks for your question. This will work for your Toyota, but your 82 pound kayak would surpass the weight capacity for this item (at 70lbs). Q: Will this work with a Feelfree Lure 11.5?? A: This is designed for lighter kayaks. The weight capacity on this is 70 pounds. The Lure 11.5 is 74 pounds. A: Thank you for your question. Unfortunately this kayak carrier's weight capacity is 70 lbs. The Native Propel Slayer 13 weighs 120 lbs. Q: Hello ACK. Will the Malone Seawing/Stinger MPG113MD fit on a 2008 Toyota RAV4 with factory roof rack without modification? And will it easily handle a 10 foot Perception Prodigy? Thanks! A: Hi, thank you for your question. Malone has a fit guide on their site, and there is a link attached for it below the product description and specs, that can answer your question more specifically. Regarding the Prodigy, it will work for that boat. Q: Will it attach to Aerobars and can you turn the kayak 45 degrees to lift onto J bars? Q: Will this Malone Seawing combo fit on a 2009 Ford Explorer Eddie Bauer cross bar factory rack? Q: I have a 2012 Xterra that has the round factory rails. Will the Sea Wing Combo with the stinger loader fit and would it transport a wiilderness tarpon? A: This roof rack will fit a 2012 Xterra and will be able to transport a Wilderness Tarpon. A: unfortunately it will not work not because of the clearance but because the bolts provided are not long enough for the width of the Hummer Crossbars. You can get OEM bolts at a hardware store to fix that problem. Q: I have a 2010 Dodge Caravan (Hero) and am considering a purchase of a Tarpon 120 or 140. Will the standard crossbars on my van work with the Malone Sea Wing? I am a mature women, will I be able to use this item? Q: Can I use this with an Ascend FS128T Fishing kayak from Bass Pro Shops? A: While we are not a familiar with the Ascend as we do not sell this kayak, it does appear to have a flat bottom. You may be better going with the Saddle Up Pro from Malone. This is better suited to for a variety of hull shapes.